A chance encounter with a young boy turns into an experience the narrator will never forget—one that changes the way he sees the world. Forced to share grim news with her children, the author reflects on life’s fragility—and its beauty. According to Zinsser, many students concentrate almost exclusively on the practical – and miss some of the most important parts of college life. The author compares e-mail styles and strategies in America and Europe—and declares a preference for one over the other. Which, the author asks, is a more effective approach to punishment – a few moments of pain or many years of imprisonment? You decide. “Woman attacked; bystanders ignore her screams.” We read such headlines and shake our heads in despair. What kind of people, we ask, could react so callously? The answer may be—people just like us. The attitudes and values of “Gen Nexters”—those 18 to 25—seem contradictory, but perhaps they actually do make sense. Raspberry looks at the expectations that many of his fellow African Americans have for themselves—and sees a serious problem. A gender studies researcher believes that if boys seem to perform worse than girls in school, important factors such as race and class may be at work – not a bias against boys in general. As leading researchers, Marlow and Abdukadirov make the argument that there is no easy answer to the issue of obesity in the United States and that individuals—not governments—must take the initiative in combating this serious issue. 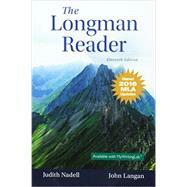 Longman Reader, The, MLA Update Edition: 4 out of 5 stars based on 1 user reviews.